This Dome Home could be a very posh or modern garden office or granny flat it could also be the answer to the world wide housing shortage. Our Domes are incredibly environmentally friendly and use 80% less concrete than conventional construction methods. This makes them ideally suited to the discerning consumer. When you first walk into one of our Domes, the first thing you will notice is how spacious and relaxing they truly are. Without any hard right angles and just gentle curves, they create the perfect environment for recreational activities. We see a clear market right here in Europe for - Garden Leisure Buildings, Garden Rooms, Summer Houses, Garden Offices, Garden Gymnasium, Hot Tub Rooms, Garden Bar and Pool Room, Artist Studios, Music Rooms, Workshops.....The list is endless!!!!! Our structures can be insulated to meet and exceed current Building Regulations which makes a space that is usable all year round. When I developed the process of building our ultra-thin Shell Domes, it was with solving the problem low-cost housing in mind. Coming from South Africa, I have witnessed the 'Shanty Towns' and slum dwellings first hand. My Parents were very involved in many Fund Raising Events to rebuild some of the Townships around Johannesburg and the Charitable Orphanages associated with this type of living. Whilst labour is cheap in the third world, there is so much corruption and back-handed dealings that very often the funds are whittled away until almost nothing remains. The goods that are then purchased for the construction are so highly sought after for the shanty dwellings that it is literally stolen in broad daylight! Apart from the very low cost of construction,one of the best things about the Dome Home is the small amount of materials required. This together with the high speed of construction and the fact that once a Dome has been has been built,the resulting home has no residual value other than that as a home. We have patents pending on the construction process and have made worldwide PCT applications to protect any early investments in this very viable process. The Proof of Concept Dome (as seen in the pictures)was built by just 3 people during 2009 and took less than 2 weeks to construct and finish each stage of the main construction - 3 coats of concrete took just 4 hours to complete! We firmly believe that it is possible for 10 people to build 10 houses in just 10 days, using 4 Construction Kits. We are currently actively seeking investment from organisations/individuals to help build a Pilot Project of just 20 Dome Homes. Once we have successful completed this program,there are several large International Aid Agencies who have expressed an interest in building our type of Dome Home world wide in both Organised Housing Programs and Secondary Disaster Relief. If you are interested in our Project or know of anyone who could help us realize this dream please call us today. Kersie or candle town is a small low-cost settlement built on the side of a hill in Verlliers Dorp just off the garden route in the western cape . I had heard horror stories of the condition of the low cost building that had been built at the grant level of R56k or 5600 pounds . It is typical of many low cost housing developments in South Africa and it was far worse than I had expected. I started speaking to the home owners, at night when the wind blows they tie ropes around the roof beams and hang on to try to stop it blowing away. one whole street lost all their roofs one night and some of the walls just fell in. In the dome buildings I was planning basic electricity a plug socket in each room with a light and swich I found that this would be considered lucsurious. Most homes do not have basic electricity let alone a meter with 4 plug sockets underneath . Its the home owners responsibility to wire his own home. This they do with what ever they can find , I saw pieces of two ply taped together to make a lead in some places the wire was bare and small kids were running around. These houses were just 3 years old the roof beams were not securely attached to the walls ,the walls were not plastered and the internal walls were not secure they moved when you leaned on them. In order to further save money the homes had windows made of galvanized steel but even that was starting to rust after just 3 years . Below are the pictures I took in just one home. One morning in January 2011 I drove around the sleepy village of Verlliers Dorp just off the garden Route in the western Cape. I came across this informal settlement (shanty town, or squatters camp) I was taking pictures of the homes for this presentation when I spotted this little house being built so I went and asked the man about his home. His name was Zulu he was from Qwa Zulu Natal and had come to the western cape to pick fruit he had no where to live so he had been sleeping rough and building his home with what he could find. Using traditional techniques that he had been taught as a boy he was packing a mixture of cow dung mud and straw on to a lattice of sticks that had been tied together . I stopped and spoke to 27 year old Zulu for about half an hour, he was polite and helpful and he spoke excellent English but that is not what impressed me the most he was confident and knew what he was doing and what's more he was making a good job and building a good home with the materials that he had. I was excited. Here was a man who had no formal construction knowledge just some hand down experience yet seeing what he had made I knew that in no time at all I could teach him the skills he would need to build one of my domes and it would not blow away in the wind. I have a vision that with the help of people like Zulu and your support we can build 1 million homes within 10 years ! What would it take for you to share that vision ? We are actively looking for people from all walks of life who would like to make a difference in their Country. 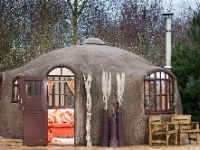 Our solution is to build a Dome using the minimum amount of materials to ensure a life long comfortable home. If you are interested in what we do, then please contact us for more information and construction cost sheets. We would like to help people help themselves. Can you help us make that happen? We are looking to build a 20 dome pilot program for project-o in zulu land at the end of 2011. Many large organisations have pledged their support to enable this pilot project to go ahead with nearly ?35 000 promised so far . If you would like to support this worthy cause and help one or more families please contact Martin at project o directly and sponsor a home today. On the 6th of January 2011 Dingley Dell Enterprises was recognised as a top 10 finalist in the Lafarge 2010 european invention awards for sustainable construction. Despite not wining one of the top 3 places Lafarge has recognised the importance of sustainable low-cost housing in the third world and has committed 20000 euros to help realize the pilot project in south Africa where 20 dome homes will be built for the Project O Children of aids Orphanage. This will help Kick start the dome home solution which impower unskilled people to build fantastic homes. We have also gained support for this program with commitments for materials from amongst others Owens Corning and easy spred. Project O children of aids orphanage has committed to raise ?20 000 to make this a reality. This amounts to just 1000 pounds sterling for a 2 bedroom 50m2 disaster resistant home. Any corporate or personal sponsorship would be welcomed. If you would like more information on how you could be involved in helping not only Project O but people around the world who live in sub standard housing then please contact us.